You can Zoom in/out; or translate the model a bit using the arrow keys. I started working on Celfuuu on February 26, 2014. Please, PLEASE help me! I love, adore SculptyPaint! It is a brill program! But since about three Java and at least one Windows update ago, I can't get it to run on my computer. SculptyPaint is a low polygon 3D creation tool original written for creating sculpts; 3D low polygon models for SecondLife. 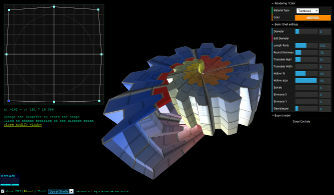 But currently it can also export to .obj files that can be read in Blender, wings3D etc. 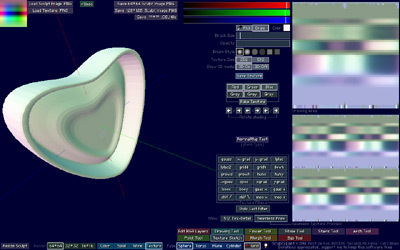 You must see this software as a personal sketch/experiment; and it`s the first application I wrote. Thanks to Saijanai Kuhn(sl) for chmod`n the mac version. Requires: Java Runtime Engine 1.6 or higher installed on your system. In case you can't get it to work, check here for some tips. I'm an artist/designer/coder, working in the new-media sector since 1993. Since 2003 an Independent Online Media Professional. I design, paint, make software; art, write my own tools, visual-generators and opensource software, and make my living/income from the internet. 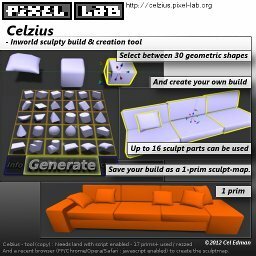 Please, help to keep Sculptypaint and the Pixel-Lab online! 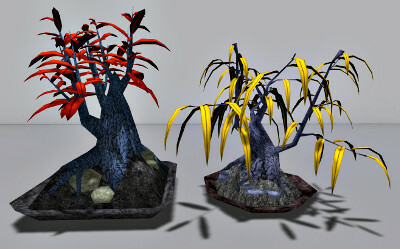 - Buy some of my 3D models and sculpt-textures in secondlife. note: Paypall-Europe got a difference between 1,00 or 1.00!